A brilliant, haunting, and profoundly original portrait of the defining tragedy of our time. In this epic history of extermination and survival, Timothy Snyder presents a new explanation of the great atrocity of the twentieth century, and reveals the risks that we face in the twenty-first. Based on new sources from eastern Europe and forgotten testimonies from Jewish survivors, Black Earth recounts the mass murder of the Jews as an event that is still close to us, more comprehensible than we would like to think, and thus all the more terrifying. The Holocaust began in a dark but accessible place, in Hitler's mind, with the thought that the elimination of Jews would restore balance to the planet and allow Germans to win the resources they desperately needed. Such a worldview could be realized only if Germany destroyed other states, so Hitler's aim was a colonial war in Europe itself. In the zones of statelessness, almost all Jews died. A few people, the righteous few, aided them, without support from institutions. Much of the new research in this book is devoted to understanding these extraordinary individuals. The almost insurmountable difficulties they faced only confirm the dangers of state destruction and ecological panic. These men and women should be emulated, but in similar circumstances few of us would do so. By overlooking the lessons of the Holocaust, Snyder concludes, we have misunderstood modernity and endangered the future. The early twenty-first century is coming to resemble the early twentieth, as growing preoccupations with food and water accompany ideological challenges to global order. Our world is closer to Hitler's than we like to admit, and saving it requires us to see the Holocaust as it was -- and ourselves as we are. 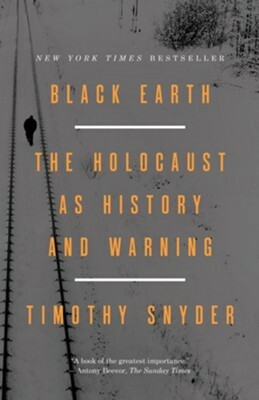 Groundbreaking, authoritative, and utterly absorbing, Black Earth reveals a Holocaust that is not only history but warning. Timothy Snyder is the Housum Professor of History at Yale University and a member of the Committee on Conscience of the United States Holocaust Memorial Museum. He is the author of On Tyranny: Twenty Lessons from the Twentieth Century and Bloodlands: Europe Between Hitler and Stalin, which received the literature award of the American Academy of Arts and Letters, the Hannah Arendt Prize, and the Leipzig Book Prize for European Understanding. Snyder is a frequent contributor to The New York Review of Books and the Times Literary Supplement and a former contributing editor at The New Republic. He is a permanent fellow of the Institute for Human Sciences, serves as the faculty advisor for the Fortunoff Archive for Holocaust Testimonies, and sits on the advisory council of the Yivo Institute for Jewish Research. He lives in New Haven, Connecticut. I'm the author/artist and I want to review Black Earth: The Holocaust as History and Warning - eBook.